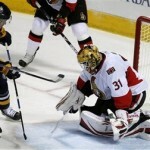 What is wrong with the Ottawa Senators? That’s a question that’s asked thousands of times every day since the start of this season. A team with this much talent should not currently be 27th in the league. So what exactly is happening to our beloved Sens? Pinpointing one problem is impossible. There’s multiple issues affecting this team, and fixing one thing won’t fix the problem. There’s the obvious lack of a puck moving defenseman. The loss of Redden and Meszaros is being greatly felt. Forwards are having to fight their way out of their own zone and through the neutral zone without having someone in the backend to move the puck up the ice. This is also leading to turnovers in our own zone, which leads to more goals against the team. There’s very little available in the market right now that would fit under our strained salary cap. The lack of a true number one goaltender is another problem. Both our goaltenders can ru very hot or very cold. Auld started strong in the season but has quickly shown that he truly is a backup goalie and not a number one. Gerber falls under the same category, and with his salary is not tradable . The Sens have to bite the bullet and wait for his contract to end. Elliot in Binghampton shows a lot of promise but still needs seasoning in the NHL. To bring him up at this time would be detrimental to his growth and would harm the team in the long run. Another issue is the lack of a true 2nd line. We have a very capable 1st line in Alfie, Spezza and Heatley, and have very capable 3rd and 4th liners but no true #2 center. Fisher, Vermette, Kelly, Ruutu, and the rest of the guys are 3rd and 4th line players. Pushing them to the 2nd line isn’t doing the team or themselves any favours, and it shows in the lack of secondary scoring. We’re now feeling Muckler’s incompetency. Trading Chara instead of Redden, dubious trades and destruction of our young talent, trading away talent and draft picks that has left our farm team severely lacking. The lack of young capable players is being felt in many ways, one of which is having little money under the salary cap. Instead of having a mix of good, young players and proven players, we have more proven players who are eating away at cap space. Luckily Murray believes in building from within and has started to bring good and great players to our farm team, unfortunately most are still 1 or 2 seasons away from being able to join the big leagues. Murray is not blameless however. His choices in coaches are questionable at best. Paddock lost all confidence in the team last year, mostly due to how he handled the Emery situation. This year, Hartsburgh was hired for his stance on player accountability and responsibility, but has seemingly not been good on his word. He also tried to bring a defensive system whereas the Sens have been historically and have been built as an offensive team. Buying into this system and executing it has been a big issue with the team. The biggest problem of them all is the lack of confidence being experienced by the players. This issue appears to have started in the middle of the 2007-2008 season and continues on to this day. The trades and buyouts that happened over the summer does not appear to have resolved whatever issues are still haunting the dressing room and the players’ confidence. Once this issue is resolved a lot of the other pieces will start fitting together. It still won’t give us a team that can contend for the Stanley cup, but it will at least allow the Sens to make the playoffs and maybe even win a round or 2. There are many other minor issues that are affecting the Senators. There’s not a magic pill that will return the team to its former glory. I’ve been a proud Sens supporter since 1992 and will continue cheering for my team, but its not as fun to watch them play when the team is playing the way they have been for the last year. I believe things can be turned around, but a lot of changes will need to happen. I don’t mean changes brought by firings or trading players like Spezza, but changes from within. Changes that start with each and every player. Players regaining their confidence, playing as a team and playing for a full 60 minutes on a constant basis. These changes can happen and will put the Sens on the road to become the great team they can be, but time is running out.